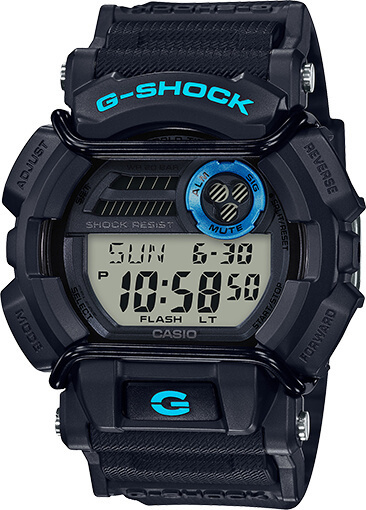 The G-Shock GD400-1B2 is a curious new model featuring a black case and band, neon blue logos, and a blue subdisplay ring. This model is newly listed as an American release for April 2019 and it doesn’t appear to have been released in Japan or Asia at all. The most recent GD-400 release before this was in 2015, so the sudden appearance of this new colorway was unexpected. The GD-400 series made its debut in 2014 and features a large case and a wire face protector (commonly called a “bullbar”) that gives it an extra-tough appearance. Features include flash alert, multi time with 4 cities, world time, 1/100 second stopwatch, countdown timer, 5 daily alarms, and Super Illuminator LED light. The GD400-1B2 has a list price of $130 USD and is currently available at Evine and JC Penney. the band seems to have a 3d text. thats new isnt it? It’s unique but other GD-400 models have it too. That section with “G-Shock” on it is like an extension of the lugs.